It was "probably the worst place in Sydney where they could have taken him", said Steve Ashley: one of a group of Australian ninjas that came to readily assist a medical student who was being attacked by muggers. A STUDENT has been saved from a vicious assault - not by the boys in blue but the men in black. The German exchange student had been targeted by the men while he was riding the late-night train home, The Sydney Morning Herald reported. They demanded he give them his wallet but when he refused and got off the train, they followed. They pounced as he made his way through a dark alley in Sydney's west. They grabbed his phone and iPod and kicked him while he lay on the ground. However, the men were spotted by a member of a nearby dojo. Nathan Smith told his sensei and the rest of the students at Ninja Senshi Ryu and they rushed out to confront the thugs - all dressed in traditional black ninja garb. On seeing the ninjas, the men fled, only to be later arrested by police. 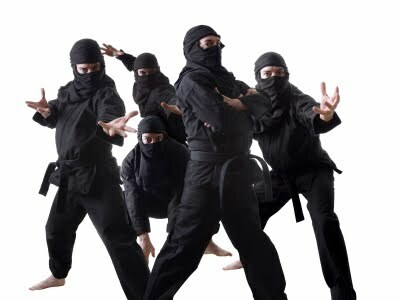 "You should have seen their faces when they saw us in ninja gear coming towards them," the school's sensei, Kaylan Soto, told the Herald. Soooo much good that can be learned from this situation. It looks like Batman is right: "Criminals are a superstitious, cowardly lot." And it hearkens back to another story out of Australia the other week where people dressed as Spider-Man and Jedi Knights foiled a comic book thief. Are you a bad enough ninja to rescue that dude?